When you imagine yourself camping, which tent heater you’ll be using might not be the first thing you think of. You remembered your thermal underwear and your cozy sleeping bag, but a tent heater should definitely be at the top of your list when camping in the cold. Keeping warm while camping is hugely important, whether you’re hiking in the Alps or camping in Arkansas. After the sun goes down, the temperature in the woods can drop pretty quickly. And if you’re camping in the winter, you have to take extra care to stay safe and warm inside your tent. You won’t enjoy yourself if you’re shivering all night, and no one will enjoy being around you if you aren’t getting any sleep. Before you set out to brave the wild outdoors, choose the best tent heater for your needs and don’t let something like cold weather stop you from having a great time. How Do You Choose a Tent Heater? There are several factors to consider when choosing a tent heater, and this guide will give you the tools you need to decide which one will work best for you. First, you should know that the cheapest option is definitely not always going to be the best option. With something as important as a tent heater, you shouldn’t skimp on quality to save a few dollars. Doing so could put your warmth and even your safety in danger, so don’t risk choosing a heater that will set your tent on fire or leave you with frostbite. Finding a tent heater at a reasonable price is certainly ideal and it is definitely possible to find the perfect tent heater for camping at a great price. Keep in mind that tent heaters labeled “for outdoor use only” shouldn’t be used inside a tent. Yeah, you’re outdoors, but you’re also inside a closed area. Gas heaters designed for strictly outdoor use produce a great deal of carbon monoxide which, as you know, is severely dangerous to breathe in. So when you’re going to be tent camping, make sure to bring along a heater designed for use inside a tent and read all of its instructions carefully. The two most popular types of tent heaters are propane gas heaters and electric heaters. 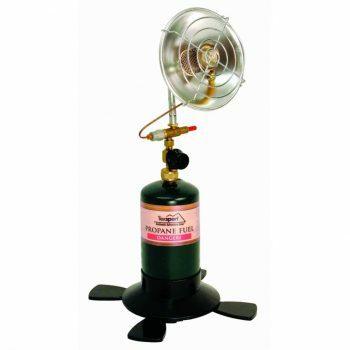 Propane heaters are popular because they are portable and easy to use. Propane heaters can produce heat for between six and 14 hours, so they are great for cold nights inside a tent. The cons of using a propane heater include their need for ventilation. You would have to let in a little cold air from outside into your tent in order to use a propane heater. You should never leave a propane heater on while you sleep due to the potential risks they can pose, like oxygen depletion or fire. Catalytic propane tent heaters don’t require an open flame and don’t produce poisonous carbon monoxide so they can be safely used indoors. Electric tent heaters are extremely popular because they don’t cost as much as propane heaters. Electrical heaters require a power source, so you might want to make sure your campsite has accommodations for electric products. Otherwise, you can power your electric heater using a generator. Electric heaters don’t run the risk of filling your tent with carbon monoxide gas and are less likely to overheat, though, so they are generally safer. Just be sure to keep them away from any water. Deciding what size your tent heater should be is key. If your heater is too big, it won’t fit in your tent. It will also be heavy and hard to carry around, and it will take up more space in your vehicle. Choose a tent heater that will fit inside of your tent without being in the way. Luckily, most tent heaters are small so it should not be difficult to find one that will fit comfortably inside your tent. If you choose a heater that is too small it won’t be able to effectively heat your tent, rendering it a fairly useless decoration. The power of heaters is measured in British thermal units or BTUs. Consider the square footage of your tent, its insulation score, and the weather conditions outside to decide whether a heater’s BTU is strong enough to keep you warm inside your tent all night. The thermal output is another way to determine how useful and effective a heater in keeping you warm. The actual formula for determining a heater’s thermal output can get confusing and you probably didn’t come here for a chemistry lesson. Consider how many people will be sleeping in the tent, the conditions outside, and how long you’re hoping to stay toasty. Gas heaters provide warmth instantly but, if they are running on a canister, that heat might run out relatively quickly. If you have a catalytic heater, you won’t have to worry about replacing canisters. Gas heaters are great for rapid warmth in areas that don’t have electrical hookups. Electric heaters warm up a space quickly by blowing hot air all around. They are very easy to set up and turn on and provide adequate heat, making electric heaters very popular. Some electric heaters feature timers or thermostats for maximum convenience. While they heat the air in your tent, they typically won’t be effective at warming up your sleeping bag or blankets. If you’re an experienced camper, you’re probably used to hearing the sounds of nature all around you. You can’t expect to have perfect peace and quiet when you’re sleeping outside on the ground. The sounds of bugs, birds, bears – if you’re not lucky, wind, thunder, rain, and other campers add to the ambiance of camping. The sounds of a tent heater aren’t quite so organic, though. Electric fan heaters are noisier than gas heaters. Depending on the electric fan heater you use, its whirs can be extremely noisy. Most of the time they aren’t that loud, though. You can always test out a heater’s noise level before taking it to the campsite to make sure it won’t keep you and other campers awake at night. Gas heaters are of course quieter because they don’t have fans. So if you want an ultra-quiet heater, either go with gas or an electric oil radiator which is nearly silent and uses less energy than conventional electric heaters. Because of their potential risks, all tent heaters come with specific safety features to keep you out of harm’s way. Gas heaters require ventilation and you should never leave one unattended due to the carbon monoxide fumes they put out. Many gas heaters have automatic shut-off features in place just in case the oxygen level in a space gets too low or the heater gets knocked over. Electric heaters also typically have automatic shut-off features if they get knocked over. Electric heaters with timers can be set to turn off on their own so you don’t have to worry too much when you’re trying to sleep. You shouldn’t leave any heater on overnight, though, as it could be a fire hazard. If you plan on using an electric heater you must make absolutely sure that it won’t come into contact with water. No matter which type of tent heater you get, make sure it is carefully placed within your tent. Don’t set it near flammable items or in a spot where it can burn someone. When you choose a heater, be sure it is one with decent safety features so you and your family can rest easy. The Texsport Outdoor Propane Heater is perfect for campers and hikers who want to stay warm without having to lug around a heavy heater. The carrying handle makes transporting this tent heater easy. The heater is designed to automatically shut off when the flame goes out so that it won’t produce excess toxic gas output. It comes with a sturdy paddle foot base so you won’t have to worry about it falling over inside your tent. It doesn’t burn through fuel rapidly, so you won’t have to replace canisters too often. You’ll need to purchase propane canisters separately. It can be louder than other gas heaters so it might not be a good fit if you’re looking for a silent heater. It can get very hot up close so it would be best suited for use in a small tent. The heater head cannot be moved, so you will need to reposition the entire heater in order to change the direction of the heat. The Stansport Infrared Propane Heater packs a lot of heat in a little package. The heater weighs less than two pounds but can heat a tent with ease for up to six hours. This heater is perfect for warming up your tent before you hop into your sleeping bags and for getting warmed up before heading outside the next morning. It’s simple to use so you won’t have to worry about setting it up. The metal dish allows you to focus heat wherever you want it. You will have to ignite it using a lighter or match, though, as it does not ignite automatically. This heater takes up very little space so you won’t have to worry about it being in the way. It features a sturdy base but does not feature an automatic shut-off setting, so be careful not to knock it over. This is one of the best and most popular affordable tent heaters. 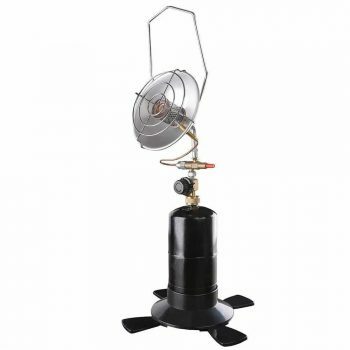 The Mr. Heater MH15 Propane Heater is a favorite among many campers. The Mr. Heater name has been prolific in the camping heater industry for decades. At 10000 to 15000 BTU output, this heater is incredibly powerful and can provide intense warmth even in snow and freezing temperatures. This topper can be conveniently mounted to tanks of most sizes, so you can get as much time out of one tank as you desire. It operates quietly so it will not disrupt your campsite neighbors. This heater includes the standard automatic safety shut-off in case it gets tipped over. This heater gets very hot so be careful not to burn yourself when operating it. With all the heat it produces, you might end up having to move further away from it when you get too warm. This heater has a large output so it is important to only use it in a well-ventilated space. 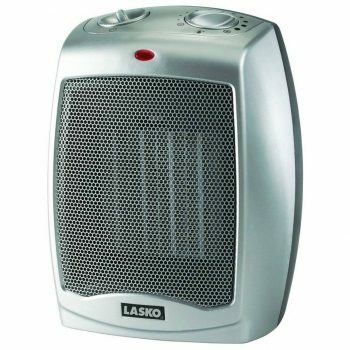 The Lasko 754200 Ceramic Heater offers great heat output for indoor and outdoor use. Unlike some electric heaters, this ceramic heater is incredibly quiet and it takes up very little space. You will hardly notice it’s there except by the heat it puts out. An adjustable thermostat acts just like your thermostat at home. You can set it to come on and heat up your tent to a certain temperature and it will go off once that temperature is reached. That means you can set the thermostat to a certain temperature and go to sleep without having to think twice about it. It also features an automatic shut-off to prevent overheating. This heater does not shut off automatically when it is knocked over, though. The power cord on this heater is about 2 meters long, so you will need to make sure you are close enough to a power supply to be able to operate it inside your tent. 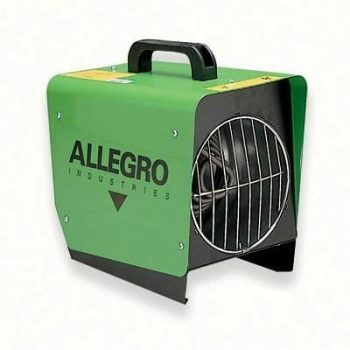 The Allegro Industries 9401-50 Tent Heater is an incredibly durable tent heater perfect for extremely cold nights outside. 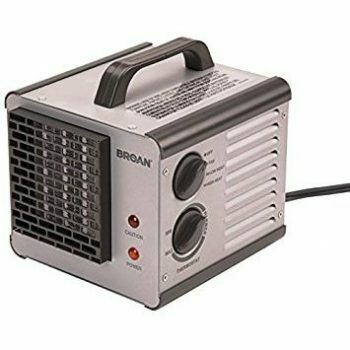 It can increase the temperature in a compatible tent up to 50 degrees F. At 14 pounds, it’s much heavier than some of the other heaters on this list. If you decide to purchase this heater, be prepared to lug it around. The added weight makes it even more durable, though. Its rigid steel housing and sturdy base mean that you don’t have to worry about this heater getting easily damaged. It is designed with an automatic safety shut off feature to prevent it from overheating. It also features a high quality, easily adjustable thermostat knob for added convenience. Because it’s an electric heater, you’ll need to be sure you have the proper hookups available. The Zodi Outback Gear X-40 Tent Heater is a heavy-duty, high-tech device that offers powerful heat to keep you warm in the coldest weather. 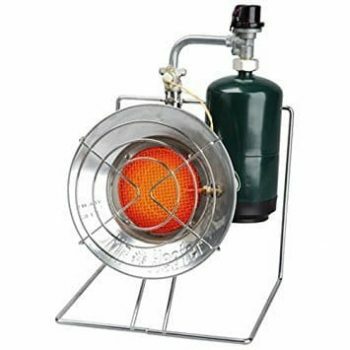 This heater easily attaches to 5-pound propane tanks. It offers safe heat for all enclosures and tents by keeping the carbon monoxide out and keeping the dry, warm air in. This heater is rather heavy and bulky but it comes with an included gear bag for easier transport. 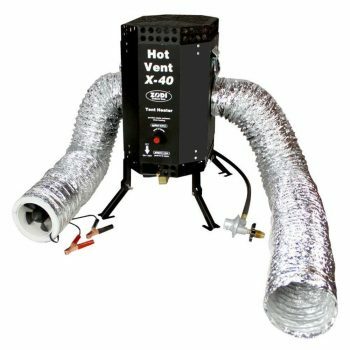 This heater offers the best of both propane and electric heaters with a 12 Volt battery-powered inline fan and stainless steel heat exchanger. This heater doesn’t feature a thermostat, so you have to control the heat output by adjusting the valve on the tank. It’s no surprise that Mr. Heater has another product on this list. The Mr. Heater F242300 MH15C Cooker is lightweight, small, and fully assembled for maximum convenience. This heater will not only keep you warm when outdoors on cold nights, but it can provide the heat needed to cook on a burner. It includes a metal stand that is easily attached to the heater so you won’t have to worry about it falling over. This tank can use up propane quickly, so be sure to pack extra cylinders. It’s perfect for heating up a tent before you head to sleep for the night and for reheating your tent in the morning! Because it is so small, it won’t effectively heat a large area, but it will definitely keep you warm inside a small tent for a few hours. It does not come with an adapter hose, so you will need to purchase one of these if you plan to attach this heater to large tanks. The Broan-Nu Tone 6201 Heater provides big heat without being a big heater. This cube-shaped heater is very small and compact so it will fit easily in an enclosed room or tent. It has two easily adjustable settings, high and low. This heater takes these settings very literally and will either put out a great deal of heat when on the high setting or a very little amount of heat when on the low setting. It can be difficult to get the hang of this heater’s output at first, but once you do, you’ll be warm and toasty for hours. The power cord is only 6 feet long so it is a big shorter than other electric heaters. As long as you have access to a power supply, this shouldn’t be a problem. This is also a very quiet heater so you won’t have to worry about keeping yourself or your neighbors up at night. The safety functions of this heater mean that it will automatically shut off if it is tipped over, or if it overheats. A caution light will also appear when it senses temperatures that are too high. Now you should know a bit more about some of the different tent heaters available to you. Whether you decide to go with an electric heater or a gas heater, you now know the benefits of each type. Deciding what the perfect heater would do for you is all about understanding how you will personally be using your heater. Once you know your desired features and budget, you can really start inspecting the different heaters out there! Finally, it is very important to always practice extreme safety when dealing with any type of heater in an enclosed space. Are you a tent warmer expert? Have we left out some of your favorite heaters from this list? If so, let us know!